The Reds are pretty good about making the majority of seats at Great American Ball Park affordable for fans. But it also helps to save money by planning ahead…so here are three tips for scoring cheap Reds tickets. Imagine all this news in your inbox! 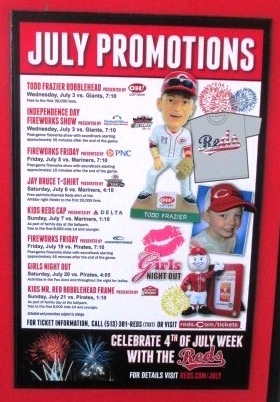 Cheap Reds Tickets, Tip #1) Use The Newsletter. The Reds e-mail ticket alerts offer some truly great deals for fans, and I can tell you the Reds put more offers in their newsletter than most teams do, even when they’re competitive on the field. Deals include half-price tickets for kids on Sundays, added concessions value and discounted tickets for members of the local library or other Cincinnati institutions. The Reds are very generous to newsletter subscribers, so be sure to sign up. Of course, if you applied online, you could have gotten a cheap ticket to get to this booth. 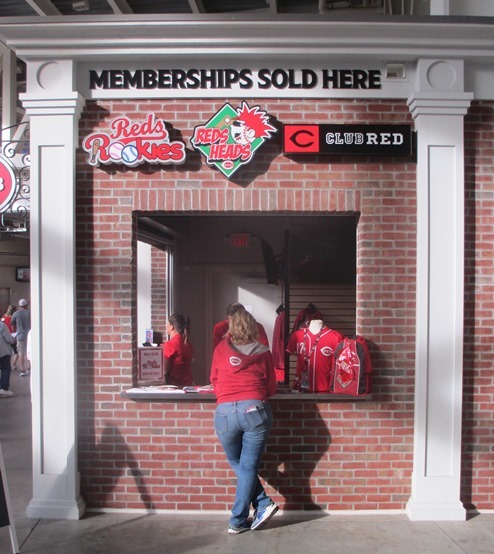 Cheap Reds Tickets, Tip #2) Join The Club(s). The Reds have three fan clubs for kids of varying age levels; you can find them on the Fans page of the Reds website. Membership includes ticket vouchers that are alone worth the price, but you also get a lot of privileges and gear to go with it. For adults, if you’re early enough, you can join the Rosie Reds Club, which is a separate entity but also offers ticket deals for members. The Reds reward good deeds. Cheap Reds Tickets, Tip #3) Help Your Fellow Cincinnatian. 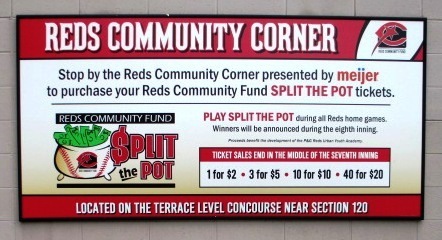 In the Community section of the Reds website are several opportunities to score Reds tickets through being a good citizen. The Reds offer tickets to fans for donating blood, participating in the “Redlegs Run”, or recycling your electronics. Nothing like getting ballgame tickets for helping your fellow human. Click the image to find deals on Reds tickets. Cheap Reds Tickets, Tip #4) Bonus Tip: Try SeatGeek. SeatGeek is my favorite third party website for Reds tickets, and I’m not just saying that because they’re an affiliate of mine. Anytime I’m looking for deals on baseball tickets, I check SeatGeek first. Want to know more about Great American Ball Park? Sign up here for my completely free Great American Ball Park e-mail newsletter series, and score some seriously valuable info about tickets, seating, transportation and food…see you at the Yard!